At CrowdFact (https://crowdfact.io), we're building a crowdsourced fact-checking solution -- empowering every person who encounters disinformation with the ability to refute it. It's an experiment to determine how news publishers, fact checkers, and audiences can work together to combat misinformation and fake news in real-time. Empowered by a universal web overlay, audiences can flag disinformation / fake news (and refute it with reliable sources) as soon as the content is published. These updates are visible to publishers, fact checkers, and other readers utilizing the overlay, so they can internalize the new information and respond immediately. We are looking to combine machine learning validation w/ human moderation to gauge the accuracy of both (a) our crowdsourced fact-checks, and (b) the content in question, as a measure to protect the integrity of the solution. We expect CrowdFact to (a) reduce the current response time on misinformation from 13 hours to a matter of minutes, and (b) provide a model for stabilizing and protecting the digital information landscape in advance of the worldwide 2020 election cycles. On a personal note, my name is Sam. Previously, I led development on the project proove.org. Proove is a discussion platform where users can earn money for sharing high-value content and commentary. We developed an ecosystem where users have -- (a) robust incentives for posting/validating quality content, and (b) robust disincentives for posting/validating low-quality content -- in order to elevate the quality and validity of information across the ecosystem. Proove was built as a solution to the burgeoning problems of misinformation, echo chambers, and junk media in the online space. Our objective was to empower a splintered online community to share valuable information, collaboratively validate it, and move forward with a cohesive understanding and an improved worldview. 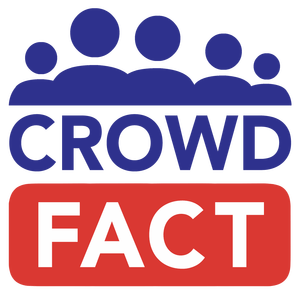 CrowdFact addresses a similar set of challenges, empowering the online community (audiences and publishers alike) to collaboratively improve the quality of information across the Internet. I've also led the project FlipList.app, which identifies critical information relevant to public policy (reputable polling data, corporate financial ties) and empowers constituents to echo that information to their communities and representatives. The objective was to improve the quality of information surrounding public policy discussions -- for both the politicians crafting those policies, and the voters electing them. Similarly, the CrowdFact project was designed to protect the integrity of public bodies in the face of growing misinformation threats, and it also empowers the online community to share important information about key public issues.